For more than eighty years the Jewish Daily Forward's legendary advice column, "A Bintel Brief" ("a bundle of letters") dispensed shrewd, practical, and fair-minded advice to its readers. Created in 1906 to help bewildered Eastern European immigrants learn about their new country, the column also gave them a forum for seeking advice and support in the face of problems ranging from wrenching spiritual dilemmas to petty family squabbles to the sometimes hilarious predicaments that result when Old World meets New. 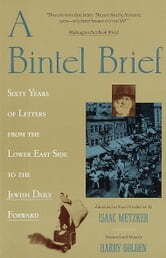 Isaac Metzker's beloved selection of these letters and responses has become for today's readers a remarkable oral record not only of the varied problems of Jewish immigrant life in America but also of the catastrophic events of the first half of our century.